FEB 15: For the G. Collins & Sons tanzanite pendant Kate wears we offer the Jamie Necklace ($78) as shown at Loren Hope. The always fabulous Janet E from the Facebook page says that for an additional $20 Loren Hope will use a different stone in the center; you can choose from the ‘Blue Sapphire by Swarkovski’ stones seen below left, or ‘Tanzanite by Swarovski’ shown on the right. Thank you to Janet E. for another great find and the extra info about switching stones! APR 2: For the Asprey Pavé Diamond Button Pendant ($4250) we offer the Nadri Geo Small Pendant Necklace ($50); we show the piece at Nordstrom. See the matching repliKate earrings here. APR 26: For the Sonam Rabgye Endless Knot necklace given to Kate by the Queen of Bhutan, this is the Endless Knot Pendant Necklace from The Met Museum’s gift shop ($325) and the Endless Knot Pendant in Antique Bronze on etsy ($32.52). 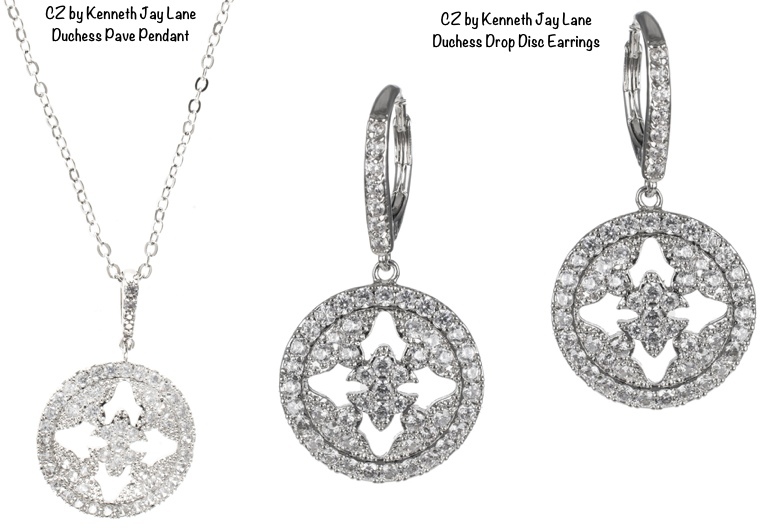 For the Mappin & Webb Empress Set (see here) this is the CZ by Kenneth Jay Lane Duchess Pave Pendant ($169) (Duchess Drop Disc earrings here). Our thanks to Anna of My Small Obsessions for posting these. 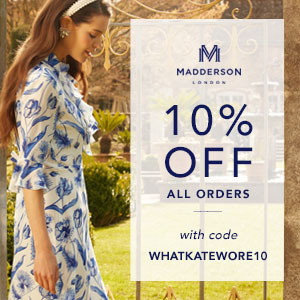 Modcloth has a nifty copyKate for the Acorn necklace Kate wore to Wimbledon in July 2012, it is the Oak-en of Gratitude necklace, just $19.99. Our thanks to WKW Facebook friend Patty Malecke for her tip about the necklace!